Thanks to a successful crowdfunding campaign with The Art Fund, Manchester Art Gallery commissioned Allchurch to make a new work for their collection based on the painting Albert Square, Manchester, 1910 by French Impressionist Adolphe Valette (1876-1942). 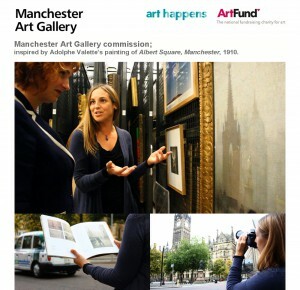 Valette, who lived and worked in Manchester for many years, painted atmospheric views of the city, which are a favourite with residents and visitors alike. 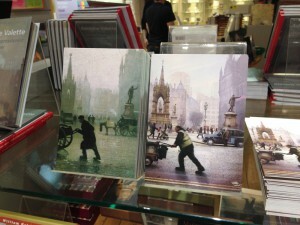 His works capture the essence of Manchester at the turn of the 20th century, in the process of transition to a modern city. 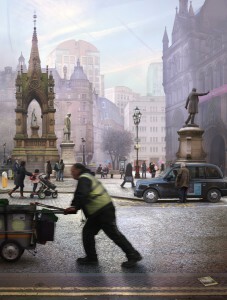 Allchurch’s re-creation reveals Manchester as the vibrant, multi-cultural city it is today, with references to the legendary music scene and yet still resonating with echoes of its historic past. 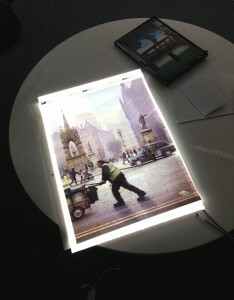 A Unique Transparency on LED lightbox has been made for Manchester Art Gallery’s permanent collection (156.4 x 120.4 x 8.3 cm) to match the size of the original painting by Adolphe Valette. 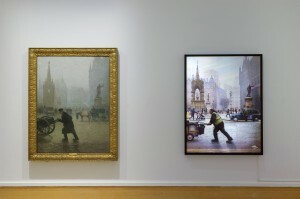 The two works were hung side by side throughout her exhibition, ‘In the Footsteps of a Master’, in 2015 – Allchurch’s first UK solo show in a major public museum.